As you might have heard by now, Flixtor is back in business. And we are better than ever before! Armed with a new team and tons of ideas and features yet to come out, we will bring you an amazing experience. 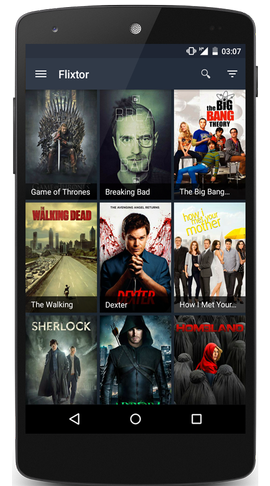 Watch Movies, TV Shows and even Anime from the comfort of your couch. Subtitle Support for more than 30 different languages. Streaming torrents in Full 1080p, 720p and even 480p for slower connections. YIFY and EZTV integration for smooth and efficient streaming. KickassTorrent Search Integration which offers over 2 million torrents. Filter your favorite content by genres and more specific categories. Ability to paste your magnet links in from any torrent website. Currently supports 3 different languages - English, Dutch and German. The update contains a fix the movies/series problems. It also adds a settings and torrent section.